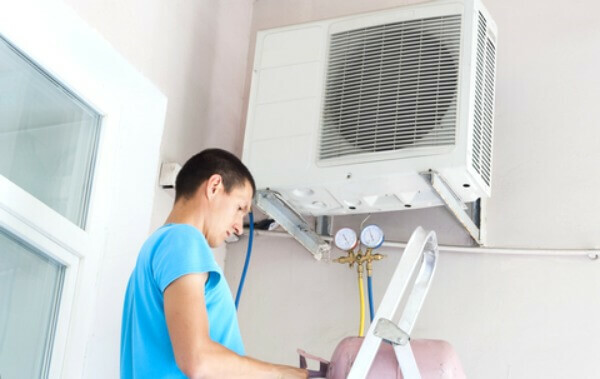 Aircon Gas Top Up, sometimes people called aircon gas refill or aircon gas recharge, is a process to recharge the aircon refrigerant into the air conditioning coolant system. This process can only be performed by aircon specialists in Singapore. Although it might look simple to conduct aircon gas top up, please do not do that by yourself. There are some safety measures for a trained aircon service personnel to execute this aircon refrigerant top up. If any non-trained personnel were to tamper the air conditioner’s coolant system, there could be more disaster than help. So what are the issues involved in this aircon gas top up? Aircon gas pressure or aircon refrigerant level – There is an aircon gas pressure working range for all air conditioning coolant system. There must be sufficient aircon refrigerant in the aircon coolant system in order to have a proper circulation in all air-con system. Too high or too low beyond this working range will cause the coolant system to malfunction. There are 3 common factors that can caused the air-con system to lose their refrigerant. • Corrosion – condensation of refrigerant during heat transfer at the aircon compressor and aircon evaporator. These condensation corrode the aircon system material through time. Joints and connection will deteriorate to cause a leak on the aircon gas level in no time. 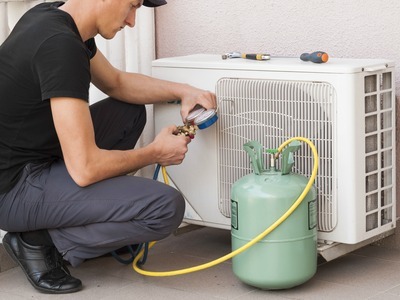 • Puncture – the tubing connection for the refrigerant to follow between the fan coil and outdoor units are protected by conduit. These tubing are fragile and cannot withstand knock. A tiny hole at any part of the aircon tubing can caused the aircon gas to leak slowly without notice. We are very caution when bending those tubing during installation. • Overcharge – too much pressure might cause the tubing joint seal to burst a small hole. Aircon gas will leak slow and unnoticed till it is too low for the aircon coolant system to work. Aircon gas top up process require some safety check. • Types – R410 gas and R22 gas are commonly used in Singapore. We do not mix different types of air con gas in the same air conditioning system. They have different properties and heat transfer temperature. Though it is very rare, but it could happened if people are given wrong or missing information. That is why we check the air-con label before we do aircon gas top up to ensure we top up the correct refrigerant. • Components – Tools, gauge and gas cylinder must be check before use. Faulty component could have led to damage of the air conditioners connection and insufficient or overcharge of aircon gas. There are 2 major benefits of the aircon gas top up service. If your air conditioning is not cold, topping up aircon gas can allow sufficient refrigerant to circulate back into the air-con system and get it cold again. Sufficient aircon coolant also allow air-con system to reach the desired temperature faster and hence prevent the system to consume more power, which save some electricity bills. It is relatively important to get an aircon specialist to top up your aircon gas. Please contact our aircon service company for gas top up service now!